In November, Assistant Professor Svetoslava Todorova of the College of Engineering and Computer Science participated in the sixth session of the United Nations mandated Intergovernmental Negotiations Committee (INC) on Mercury in Thailand. The INC on Mercury has been instrumental in the development of a global mercury treaty known as the Minamata Convention that addresses mercury contamination in the environment. 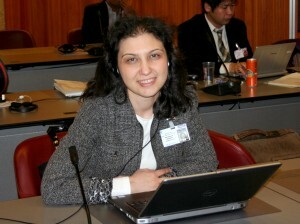 Todorova has served as a science observer for the INC since 2011, participating in four sessions. In this role, she contributes her technical expertise. Mercury contamination is a serious environmental and health problem. A neurotoxin, mercury causes long-term cognitive and developmental defects in humans. It accumulates in lakes and oceans, where it can persist in ecosystems for decades. When we eat fish that live in these contaminated ecosystems, we become exposed. In 2011, while a Ph.D. student at SU under the supervision of Professor Charles Driscoll, Todorova met representatives from the UN Environmental Programs (UNEP) Chemicals Branch—the group that administers the INC sessions—at the International Conference on Mercury as a Global Pollutant, along with the the chair of the INC. After a few conversations, they invited her to participate at the INC sessions as a science observer — a highly regarded service. The INC on Mercury finalized the Minamata Convention in January of 2013. The treaty is currently open for signatures from countries around the world. Once 50 countries ratify it, it will officially be adopted. At this stage, the goal of the INC working meetings is to clarify the text, decide on type of monitoring activities and help the countries develop their national implementation plans, all with the goal to help facilitate rapid implementation of the convention. SU is in the process of becoming a partner of the Global Mercury Partnership, a scientific advisory body on mercury to the UNEP. Todorova’s work will continue in 2015. Now that the treaty has been drafted, it is her hope that more countries will ratify and implement it—protecting the environment and living things from the dangers of mercury contamination today and in the future.